We are enjoying a nice time in Les Marecottes where we are holding our first AlpenStep meeting. On topic are hacking, discussions and presentations about the various projects. Bug fixing was great, but the highlight was the GSCake. 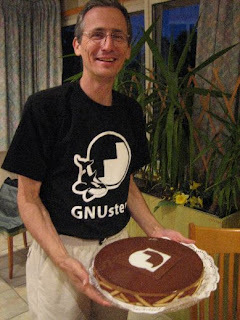 Please check the attached photo with Gerold Rupprecht, patient organizer of the whole event, and the excellent instance of [GSCake initWithFun]. Subclasses of the GSCake object are allowed, but please send us the instance for compliance certification. We had a presentation from the Etoile and their frameworks, simplewebkit bug smashing. Extremely geek was the new OpenMoko Neo which Nikolaus brought. Members present were the busy organizer Gerold, gui maintainer Fred, etoile developers Quentin and Nicolas. GAP was represented by me. Lars was present too, Gürkan felt unwell unfortunately and left earlier.